I don't think I've always been so techie. I guess when I look back in time I did go to computer camp in 1985 with Mr. Linson. I did have an Atari 2600 with a keyboard. 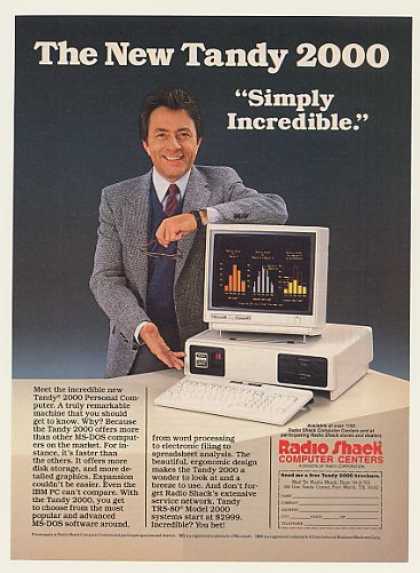 My dad had a Tandy 2000 (yeah, that was a computer brand) and it came with a super sweet dot matrix printer that my brother and I used to use Print Shop to make banners to hang up around the house. The funny thing is, now, I still own a Dell computer with a 3 1/2" floppy drive (What's that?) and I still proudly use a dumb phone. Yet, here I am teaching and informing people about technology. Luckily for me, my school district is beyond generous in its ability to provide students and staff the technology tools they need to succeed. I think my curiosity with technology continues to evolve as we have entered a new stage of technology: Web 2.0. The funny thing about that term is that it's probably already outdated. In a nutshell, Web 2.0 is a newer version of the internet and how we interact and collaborate. The old internet was a one-way street--you visited website, read information, and used it accordingly. Now, with Web 2.0, it's all about collaboration, sharing, and interacting with one another. Now you're probably thinking, "Wasn't this supposed to be about using podcasts in speech therapy?" Yeah..yeah, I'm almost there. Anyway, I took two courses in Educational Technology (highly recommended) and learned about new ways to use the web to create projects with students (much like my old Print Shop activities from computer camp). One of the tools that I learned about was using podcasts. When I started to learn about podcasts, I quickly found out that people listened to them for entertainment, education, and leisure. Then it hit me--I can use podcasts as a tool to get students to record, reflect, and improve their speech and language skills! It took some time to figure out how to record into my computer and then upload them onto a podcasting website. It helps if you like to sit at a computer 24/7. If you're not like me, however, you can figure it out by watching tutorials on YouTube or other websites. That's the technical part you need to learn. I know that sounded way too easy. Hey, you have to figure out some of it on your own! The real meat and potatoes of using podcasts as a tool in speech therapy is to figure out how you are going to use podcasts in speech therapy. Man, I'm good! So, how can you use podcasts? How about for articulation in connected speech? Speech fluency. Reading fluency. Prosody. Phrasing. Rate of speech. Conversational skills. Volume control. Topic maintenance. Topic shifting. Turn taking. Self-reflection. Self-correction. Recording language samples. Documenting stuttering moments. Keep thinking. There's more! I really like the podcast format because it's current. It's age appropriate. It's interesting. If you let the students take the lead on the topic, then you've got buy-in. For instance, I had a rather quiet high school student with moderate speech articulation errors in connected speech who didn't really participate much with his speech therapists. (Hey, he was in high school and he wasn't really motivated to go to speech therapy.) So I asked him what he liked. Zombies. I knew absolutely nothing about zombies. This was perfect because he could tell me everything about zombies. Guess who was excited to create his very own podcast about zombies? Hook, line, and sinker! We recorded at least four podcasts about zombie rules and zombie survival skills. We even spent two to three sessions coming up with an intro to our podcast using Hells Bells and Thriller as our theme songs. Get creative! Recite poetry. Tell jokes. Read lines from Shakespeare. Do a product review. Interview guests. Download some podcasts to listen to for fun. Explore and see what they sound like. If you have a smart phone/iPhone/ tablet/iPad (anything that I don't personally own), you can download them and listen at your leisure. I do have a school issued iPad, by the way, which is how I do it. It will take time, but you can download Audacity (and Lame for Audacity) and learn how to use it. It looks very technical, but with a little patience (and YouTube tutorials), you'll get the gist of it. I haven't done it yet, but you can also record in the Garage Band app. Practice recording tracks on your own. My first project was reading a chapter at a time from my Educational Technology book for my class. I played around until it made sense. Write a general script/outline. Interview your student. Have the student interview you. Pre-write the questions. You know those dumb questionnaires that are always floating around on Facebook? Print one of those off and ask questions. Find a free podcasting site. I use Podbean. It's free. There are others out there. Most of them are fairly cheap. But if you want to practice without paying, try Podbean. Keep confidentiality in mind. That's a big one. Obviously, you shouldn't post anything online without permission from the person/family. My former student gave me permission to post our podcasts (see below), but if you didn't want to actually post them, you could send them home via their mp3 players (I know that's outdated) so that they could share with their families.